and mankind begins with childhood. This has given rise to a form of pre-school education, founded in Italy in the 19th century, which gives 21st century children an excellent start in life. MARIA MONTESSORI was born in Italy, and was Italy’s first woman doctor. Her training in psychology, physiology and neurology was extensive. Her first job was at the psychiatric clinic of the University of Rome. She had a very special affinity for and a great appreciation of the potential of children, and decided to make the transition from medicine to education. Initially she visited asylums for the insane, feeble-minded and neurologically damaged, and she developed a series of graduated exercises in motor-education. In 1899 Dr Montessori gave a lecture in Turin entitled “Moral Education”. Her theories attracted the attention of the Minister of Education, who commissioned Maria to give a series of lectures to teachers. This led to the opening, shortly afterwards, of the Medical-Pedagogic Institute, with Maria Montessori as director. By 1901 Montessori felt that her methods could be used with normal children. Through her didactic methods, she was educating sub-normal pupils sufficiently for them to pass state exams designed for normal pupils. She returned to university to study experimental psychology and philosophy. In 1904 she was appointed Professor of Pedagogic Anthropology, in Rome. She was the first Italian woman to become a professor. Shortly afterwards, she was given the Chair of Hygiene at the Magistero Femminile (Women’s College in Rome). Montessori was influenced by a variety of people. Jean Itard used a form of behavioural therapy where bad behaviour is ignored, and good behaviour is rewarded. Seguin discovered that mental activity is enhanced by developing perception. He believed that training of the sense organs enhances total development. Also that increasing the function of any one sense organ prepares the ground for further development of another sense. In 1906 Montessori initiated her educational methods amongst the normal children in the slum tenement sector of Rome, San Lorenzo. By day the development was empty except for children under school-going age. There was nothing to occupy these children, and they wrought a fair amount of havoc. Using the Montessori Method Maria reported: -From timid and wild as they were before, the children became sociable and communicative. They made different relationships with each other, and their personalities blossomed. They showed extraordinary understanding, activity, vivacity, and confidence. They were happy and joyous. “Montessori insightfully described children as: “the forgotten citizens” who had never been accorded their rights. For, within the child itself there is the possibility of the true nature of man being realized, the perfect union of body and soul, the compound that is there to be attained in the right soil. Her observations led Maria Montessori to believe that the small child possesses faculties of will and knowledge out of all proportion to his powers of expression. International recognition came quickly. Visitors came to observe first-hand the successful teaching and learning taking place in the San Lorenzo Children’s Houses. The Montessori movement spread all over the world. The first Montessori Training Course was given in 1909. Private Montessori Schools were established in Italy, and Montessori travelled extensively, lecturing and training in England, Spain, Australia, Holland and the Americas. Montessori stressed the need for a prepared environment, which maximizes the special creative periods of a young person’s development. The child loves to use his own will, and this is strengthened by his freedom to choose an activity at his own level, from the prepared environment. The immediate use of maximum effort at the instigation of a person’s own will brings new self-mastery coupled with a serene and joyous disposition. In the early twenties Montessori was appointed Government inspector for schools in Italy. In 1934, though, Mussolini closed down all Montessori’s schools in Italy and Germany, and she fled to Spain where she founded a special Teacher Training Institute in Barcelona. From 1939 till the end of World War ll she lived in India. To this day India is an important centre for Montessori teaching. During the war Montessori pursued lasting peace through education. She was nominated three times for a Nobel Peace Prize. In 1950 she became the Italian delegate to UNESCO. As Montessorian’s we have inherited Maria Montessori’s belief that peace will only happen if adults are at peace with themselves. The secret of adult peace arises out of creating for the child the right kind of learning and growing environment. Montessori admonished, “We know how to find pearls in the shells of oysters, gold in the mountains, and coal in the bowels of the earth, but we are unaware of the spiritual gems, the creative nebulae, that the child hides in himself when he enters this world to renew mankind.” Thus we need to build an education that is at one with the world and nature, and at one with the basic drives and developments within mankind. We have to orientate each child in his universe. This is what his own special education is designed to do. He must have as clear a vision as possible of all that the world holds. Each child is heir to all the knowledge and skills that man has acquired through the centuries. This knowledge and these skills have to be made available to each successive generation of young children. This should be done through a carefully planned environment in which each child can be active, and can learn at his own speed and his own level. The child’s activities should be within an environment which also includes love and security. 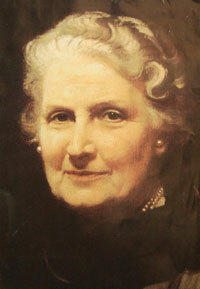 When her internment ended in 1946, Montessori visited England and revived the movement there. Despite her frailty, she continued to travel extensively, lecturing and training. She was widely honoured, receiving royal, civic and academic awards. She died at Noordwijk in the Netherlands, on 6 May 1952, at the age of 81.